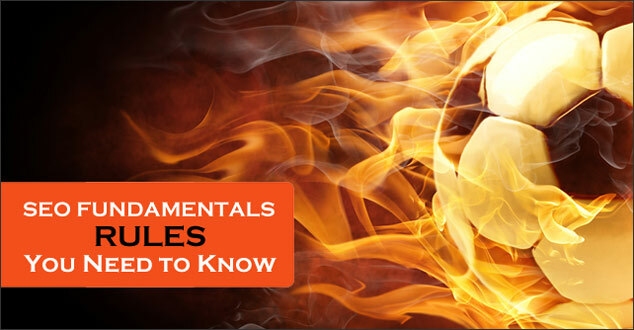 Are you interested in learning SEO fundamentals? Are there SEO practices that can actually hurt? Soccer – or as it is called in many parts of the world, football, has been referred to as the international sport that transcends boundaries and language. In leagues across the globe, players are given a code of conduct and set of rules that must be followed in order to play and stay in the game. So, what do soccer and SEO have in common? SEO or search engine optimization is like the game of soccer because learning the fundamentals takes time and patience. In soccer, you practice and polish your skills in order to hit that perfect shot. When you finally smack the ball into the upper corner of the net, you know that all your hard work has paid off. The feeling of accomplishment is one of pure elation. In the same way, when you have worked diligently to optimize your website and finally hit a top position in the search engine rankings, the realization of reaching your goal is priceless. Another way that SEO and soccer are similar is in the fundamental laws of the game. When you first start to play soccer, you learn very quickly that you have to follow the rules or you can be given a yellow card as a warning or a red card that ejects you from the game. Likewise, SEO fundamentals must be followed, and if you break those rules, you can receive a warning or get kicked out of the search engines. It is no secret that Google is the most popular search engine in the world. When Google sets the rules or laws of the game, SEO players need to listen and abide by those rules. What do you need to avoid so that you won’t get hit by a Google yellow or red card? Google is very clear with its quality guidelines or “Laws of the Game”. The company has specifically outlined 12 guidelines for unfavorable techniques to avoid. Let’s take a brief look at these “Fouls and Misconduct” to be clear on what NOT to do to stay in the game. Note: the bold text is from Google’s actual guidelines, followed by my brief explanation. The practice of automatically generated content includes using a program to write text content on a website without human intervention. Link schemes are tactics that attempt to artificially manipulate Page Rank to increase search engine ranking placements. This approach includes links to and out of your website and excessive link exchanges. Cloaking is the strategy of creating a web page to show one thing to the search engines and another to the end user. This practice is in direct violation of Google’s Webmaster Guidelines. A sneaky redirect is a deceptive approach to show one thing to the user, then, when the link is clicked, the user is taken to an entirely different topic on a web page. Hiding text or links is a scheme to conceal information from users, manipulating rankings by serving something different to the search engines. An example of this is white text on a white background. Doorway pages, also referred to as Gateway pages are intentionally designed around a specific keyword topic or phrase and take users to one specific destination. They typically have low-quality content with the sole purpose of funneling traffic to one page. Scraped content is stolen content that is included on a website as a whole or slightly modified from the original, but does not provide added value. Simply put: plagiarism is wrong and will not be rewarded by the search engines. This practice generally involves creating web pages or websites that include affiliate marketing information (photos, text, and links) without adding additional value for the end user. This tactic utilizes keyword stuffing or using keywords over and over with the goal of increasing search engine rankings. Generally, keyword stuffing will look unnatural and is not a good experience for the reader. Enough said. Not nice things to do! Rich snippets are the descriptive text under the linked title in the search engine results. An abuse of the rich snippets would include the unscrupulous strategy of providing information that is totally irrelevant to the page in the attempt to increase search engine rankings. The search engine giant does not appreciate machines sending computer generated queries to check website rankings. This is a direct “foul” as it uses up web resources. If your site violates one or more of these guidelines or “Rules of the Game”, then Google may take manual action against it. For Google’s explanation in detail, please see Google’s Webmaster Guidelines. Soccer and SEO are similar as they both take time, patience, and skill to reach an ultimate goal. They are also alike because each has fundamental laws of the game, or rules, that players must follow to remain in the game. By avoiding these 13 SEO manipulation techniques, you will be able to stay in the game. Do you have any other thoughts about how SEO and soccer, or any other sport, share similar fundamentals? I would love to hear them in the comments below. Weather it is soccer or Google – Rules are rules and we need to abide by them. We have an obligation to our business to know the rules..read them and follow them. As long as we do that and don’t try to outwit the game, we are fine. I see many that are trying to plot plan and scheme…in the end, they loose. I rather play by the rules and be a winner! Thank you for stopping by. You are absolutely right. Rules are rules and we need to abide by them. I have also seen some try to game the system, and in the end, they did end up losing the game. I would rather play by the rules of the game and be a winner, too! Now you’re talking my language, or at least the language of the men in this family! LOL We’re a soccer lovin’ kind of family, and can really appreciate the analogy between soccer and SEO. Your #1 puts a kink in my chain, I cannot stand sites that scrape content and keep going like the Energizer Bunny… Yuck! There are human inspectors at Google that go around checking sites, so a lot of these violations are found and the site is penalized, for which I’m glad. It is great to hear that your family is a soccer lovin’ kind of family, too, and that you enjoyed the analogy between soccer and SEO. I agree about #1. It also puts a kink in my chain. It is amazing that some try to get away with this. Thank you for stopping by and for your comment. I hope you had a great weekend and a fantastic one ahead. My niece and nephew used to play soccer when they were kids so I could relate to this analogy. I just read a post earlier today from a friend who was able to finally get Google to remove a penalty from her site. It’s taken a year so that is a big wake up call of things you need to be aware of because over time, doing the wrong things can penalize your site with Google which means not showing up in the search engines. Although I’m not a big fan of Google I don’t want to get on their bad side so following the rules is the smart thing to do. I just had to turn another site in for stealing my content. Their entire site is automated, nothing is original, no comments are allowed and there is no way to contact them. I don’t even see the point of sites like those but it sure is a pain to have to deal with them when they’re stealing your stuff. Hope Google gets them soon. Great points Robin and thanks for listing these out. Now let’s hope no one we personally know is making any of these mistakes. It is great to hear that you can relate to the soccer analogy. My children and nieces and nephew all played soccer. You may have guessed that I’m a huge soccer fan. I’m sorry to hear about your friend who was hit by a Google penalty. I’m so glad to hear that if was finally lifted. I’m also sorry to hear that you had to resort to turning that site into Google for stealing you content. I agree. I don’t see the point of people/sites doing this. I hope it will work out for you. Thank you for dropping by, for taking the time to read this, and for your comment. It is always a pleasure.